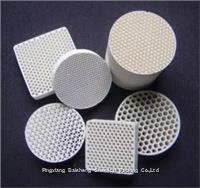 Ceramic honeycomb monoliths have been well used in chemical, metallurgical, gas and environmental protection industries. 1) tower packings - With high surface area, even distribution of fluid and, efficient in mixture separation in chemical & petrochemical industries. 2) Catalyst carriers - Reduce the oxidation temperature of VOC in purification of industrial exhaust gases in RCO systems and automobiles. 3) Regenerative heat step - up transformer - Large heat capacity, low resistance to fluid and, energy saving up to 40~70% in RTO systems. 4) Gas combustion distributor - Distribute the heat uniformly, and make the combustion completely, It can save energy more than 10%.